Responding to shrinking tax revenues, Gov. Dannel P. Malloy’s administration suspended about $140 million in payments to Connecticut’s acute-care hospitals this week. The administration’s decision, which potentially reverses legislative actions in December to bolster hospital funding, drew angry responses from the Connecticut Hospital Association and the legislature’s Republican minority. This marks the latest swing in an unusually volatile state funding plan for hospitals this fiscal year. The industry originally was budgeted to pay $556 million in taxes and receive $256 million in reimbursements, either through a limited pool for small hospitals or a broader program for all facilities. In mid-September, responding to a weak stock market, the administration cut payments to hospitals and withheld others. At that point, the industry expected to receive just $64 million back against $556 million paid to the state. In a December special session, legislators reversed some of the September cut and reached an understanding with Malloy to release withheld payments — all of which elevated this fiscal year’s payments to the industry to $164 million. The latest action by the administration suspending about $140 million in payments now leaves hospitals slated to receive $22 million in tax reimbursement payments this fiscal year — or just 4 percent of what they will pay. 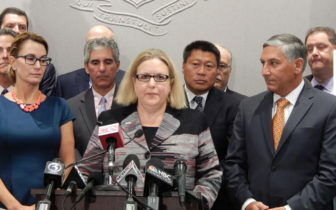 Connecticut Hospital Association CEO Jennifer Jackson, center, during a press conference last September with House Minority Leader Themis Klarides and Senate Minority Leader Len Fasano. The administration was responding to last week’s projections showing badly slumping state income tax receipts. According to the legislature’s nonpartisan Office of Fiscal Analysis, anticipated revenues have been lowered by almost $200 million for this fiscal year, and by $350 million for 2016-17. Nonpartisan analysts are projecting general fund deficits of $266 million for this fiscal year, a gap of just under 1.5 percent, and about $900 million, or 5 percent, in 2016-17. But the Connecticut Hospital Association argued the governor’s actions would harm Connecticut’s patients and its economy. “We are outraged by the governor’s refusal to pay hospitals for care provided to patients,” Jennifer Jackson, the association’s CEO, said. “His actions are breaking the health care system and increasing costs for patients. Elliot Joseph, president and CEO of Hartford HealthCare, said the latest development was “distressing” on two fronts. The legislature’s top Republicans also criticized the Democratic governor’s decision. The provider tax has been a growing source of controversy since 2013 — one year after Malloy and the General Assembly imposed it on hospitals to leverage more federal aid for Connecticut. The industry originally paid $349 million in provider taxes in the 2012-13 fiscal year, and received $399 million back from the state. This back-and-forth arrangement enabled Connecticut to qualify for about $200 million in federal Medicaid payments, allowing state government to come out ahead as well. But tax reimbursement payments gradually were reduced each year after that — a trend that prompted criticism from both sides of the aisle that Connecticut was forfeiting hundreds of millions of dollars in federal assistance. Last fiscal year hospitals paid in $349 million and received $80.6 million in reimbursements. And the hospital association said the gradual evolution of this tax from a tool to tap federal dollars into a very real burden on hospitals has taken a heavy toll.